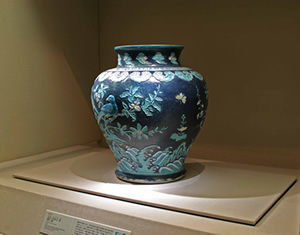 As ceramics reflect light in all directions, one must be extremely sensitive in lighting them up properly for display. Our natural light display room on the second floor introduces natural light from the skylight, enabling viewers to see the original tone of the piece. We have also adopted a special LED lighting system known as “Flatter” (a device that enables uniform flat illumination) for artificial lighting which shows the wares more effectively. With the help of these lighting effects, the atmosphere of each gallery has been changed to match the characteristics of the objects. While our Chinese Ceramics Galleries have high ceilings and bright rooms in which people can be immersed into the flamboyant world of Chinese ceramics, the ceilings of the Korean Ceramics Galleries are relatively low and the lightings have been diminished to produce a chamber-like, cozy feeling. 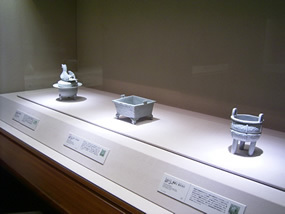 The Japanese Ceramics Gallery, on the other hand, has low display cases with lighting restrained, rendering an atmosphere of viewing the wares in a tatami-mat-floored guest room. The platforms on which the items are placed are our original shock absorbent platforms. When an earthquake occurs, the built-in device would function automatically, absorbing shock and vibration to protect the valuable pieces. 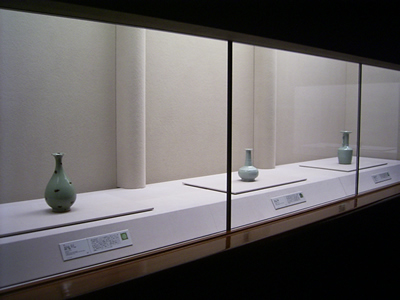 In order to show the entire surface of the ware, individual glass display cases would be ideal, but we do not have enough space for such a displaying method. Three of our display cases in the Chinese Ceramics Galleries have turntables that slowly rotate the objects so that visitors can enjoy viewing the whole surface. The turntable, also equipped with shock absorbent, is the world’s first device with which a significant object can be viewed thoroughly while being protected from shocks.